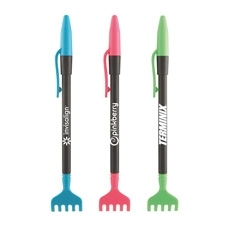 Perfect for anyone with a back, our handy Neon Extending Backscratcher with Pen is the ultimate feel-good gift. This compact gift features a pen and telescoping scratcher that extends 16” to target hard-to-reach spots on your back, or anywhere that could use a good scratching. Sturdy metal extension pole conveniently retracts to the size of a pen. Go ahead and pick up a bundle. Your customers will love this 2-in-1 gift from you! Imprint Area: 2" x .23"